If you've quit smoking, but still miss the trappings -- the feel of the package, the confidence you got from knowing there were still 18 cigarettes left in the package, memories of your passionate romance with James Dean or Sharon Stone, or just the excuse to take a short break from work -- there's still hope for you, according to at least one concept developer. Russian industrial designer, Anton Schnaider, originated the concept of Cigarettea, as it is illustrated in the above delightfully clever "Don't smoke tea. Drink cigarettes" ad. His idea is that the cigarette portion would contain the tea leaves, and the filter would act as a floater device, so that the cigarette would not sink - no need for a string to pull out the used Cigarettea. 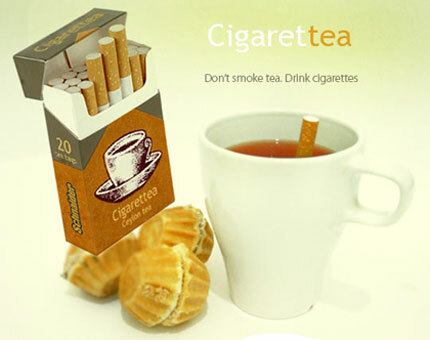 Cigarettea could restore some of the trappings of cigarette smoking that you miss... the feel of the box, the confidence of knowing that there are still several cigarettes left in the box, for as long as that were the case, and the excuse to take a short break from work to grab a cigarette, uh Cigarettea. As for memories of a smoke-filled bedroom after passionate love-making with James Dean or Sharon Stone? I'm just not sure about that. via Trends Now sources: Schnaider Live Journal, and AntonSchnaider.com. Thats a very creative and well design products & advert.